Constructed in the Northern Wei dynasty, and located on the middle section of the cliff, this is the earliest central-pillared cave at Mogao. It has a gabled ceiling in the front and a flat ceiling in the back. Under the two ends of the beam of the gabled ceiling and the molded rafters on both slopes are wooden brackets, a structure of Traditional Chinese architecture. Between the rafters are images of celestial beings holding lotuses.The flat ceiling in the back is connected to the ground by the central pillar, which has niches in all four sides for various statues. The large niche in the east side contains a cross-legged Maitreya Bodhisattva, which was originally flanked by four attendants, and now there is only one on the south side and two on the north side. On both sides of the nimbus on the west wall in the niche are attendant bodhisattvas respectively above Vasistha and Mrgasirsa. On the ceiling of the niche are apsaras. The lintel is decorated with reborn children on lotuses. The niche beam shaped like a dragon is supported by two pillars wrapped in painted silk. Most molded figurines on the two sides or above the niche have been damaged, only a few are preserved. The other three sides each have two niches, one above the other. The upper niches shaped like the Chinese traditional gateway on the south and north sides each contain a cross-legged Maitreya bodhisattva, while the lower arch niches contain a dhyana Buddha. The upper niche shaped in the form of two spreading trees and the lower arch niche in the west side each contain a dhyana Buddha flanked by two attendant bodhisattvas out of the niche. There are molded figurines on the two sides and above the upper niche, which are blackened by sootiness. On the four sides of the central pillar below the niches are images of yakshas.A niche with the Chinese styled gateway is dug out of the side walls under the gabled ceiling and contains a cross-legged Maitreya bodhisattva. And four arch niches are made in each of the side walls in the back, respectively contains a preaching Buddha or a dhyana Buddha. Among them the heads of the Buddha statues in the south wall are all partly damaged, while two in the north wall are well preserved.The top section of the four walls are used for heavenly musicians, and below them are thousand Buddha motifs, in which each Buddha has an inscription beside indicating his title. There are totally 1235 Buddhas. The west sides of both side walls each contain a preaching scene, and in the center of the west wall is a preaching scene of a white-robed Buddha.The middle registers of the south and north walls under the niche in the front are covered with Jataka tales and Buddha's life stories. On the south wall is an illustration of Mara's Attack, and to its west are scenes of the Sattva Jataka. On the north side is the karma story of Nanda, and to its west is the Sibi Jataka.There is a successive decorative border consisting of algebra motifs such as checkboards and lozenges and plants like transformed lotuses and twisted honeysuckles on the four walls which separate the upper thousand Buddha motifs, preaching scenes and story paintings from the lower images of the yakshas.There is a window above the entrance. On both sides of the entrance and the window are thousand Buddha motifs. A part of a Sui Dynasty preaching scene is preserved on the north wall of the corridor. There is a window above the door, and around the window there are traces of multi-layer paintings. Above the window are lotuses (blackened). On the south and north sides of the door and on the wall above the door are heavenly musicians above the thousand Buddha motifs. On the lower walls are guardian warriors (obscured). In the niche under the gabled ceiling is a cross-legged bodhisattva, and above it are nine heavenly musicians, and under the two ends of the beam and the rafters are wooden brackets. On the two sides out of the niche are the thousand Buddha motifs. Below the niche is an illustration of Defeating Mara. 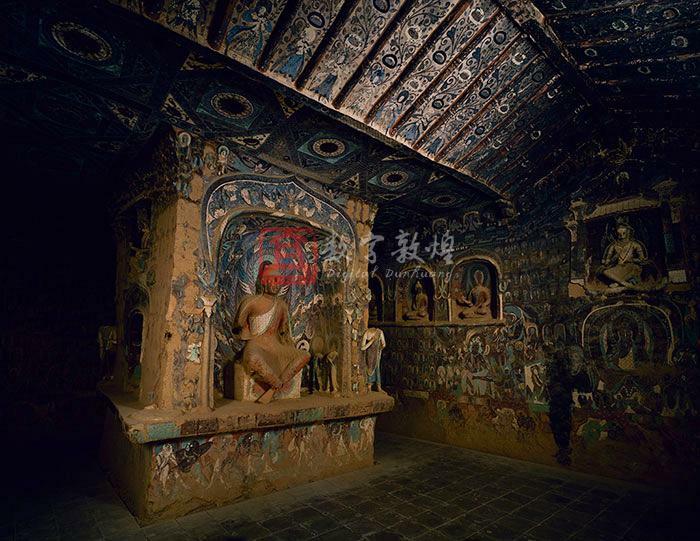 This is the earliest mural of this theme in Dunhuang caves. In the center of the picture, Sakyamuni sits on the throne under the bodhi tree with his hands in Bhumyakramana mudra, on his two sides are Mara's armies holding various weapon to attack. The scene on the lower right side depicts Mara's three daughters trying to tempt Sakyamuni. They each wear a crown, a cloak, and a long skirts of Kizil style. With magical power, Sakyamuni transformed them into three ugly old women, which is painted on the left side.Right to the west side of Mara's Attack is the tale of the Sattva Jataka. The story goes like this: Three princes went hunting in the forests and found a hungry tigress with a few cubs on their way. The third prince sacrificed himself to save the tigeress. Various episodes of different time are arranged in a same picture, which are separated from each other by the mountains, forests and motifs. The episodes include: three princes seeing a hungry tigress and its cubs in the middle on the upper part, Sattva sticking his throat and jumping down on the upper west side; Sattva feeding himself to the tigress on the lower west, two brothers reporting to their parents on the lower east, and finally his parents crying in sorrow and building a pagoda for Sattva on the upper east side.The wall in the back is also divided into three registers: the upper register has seventeen heavenly musicians, and the middle register has four arch niches containing either a preaching Buddha or a dhyana Buddha. There were originally two flanking attendant bodhisattvas, now only one is survived in the second and third niches. The interior walls of the four niches respectively have four, six, six and eight lotuses and children playing on lotuses. The niches are connected to each other by the niche beams decorated with honeysuckle motifs. Out of the niche on the west end are an apsara and two attendant bodhisattvas. The west side of the Sattva Jataka is filled with the thousand Buddha motifs, and in the center of which is a preaching scene. Below the niches is a decorative border and below the border are twenty-five yakshas. On the top register are eighteen heavenly aparas, and below are the thousand Buddha motifs, in the center of which is a white-robed Buddha in Dharmachakra mudra who is flanked by two standing Bodhisattvas. This picture is well preserved, and the haloing traces are still visible. The dense and smooth folds of the kasaya give it a sense of three-dimensions. A decorative border below separates it from the lower seventeen yaksha images. In the niche under the gabled ceiling is a cross-legged bodhisattva. Above the niche are a seated Buddha and four apsaras. The top register depicts heavenly musicians, and only eight of them are preserved today (blackened as a result of sootiness). Under the two ends of the beam and the rafters are wooden brackets.On the two sides out of the niche are the thousand Buddha motifs, and below the niche is the karma story of Nanda. In the picture, Sakyamuni sits preaching, and on his two sides are three completely same episodes in symmetry: namely Nanda sitting in meditation in the mountain forests, Nanda listening to Buddha's preaching, and Nanda bidding farewell to his beautiful wife. The figure to the lower right of the Buddha is Nanda, and the scenes in the lower corners suggest Nanda's attachment to his wife. This is the only example of this story at Dunhuang.Below the niches is the Sibi Jataka tale starting from the east side. The story is as follows: King Sibi would use his own flesh to save a dove chased by a hawk, and finally he sacrificed himself because no matter how much flesh was cut off, it was still lighter than the weight of the dove. In the picture, King Sibi sits in the center, and the main episodes and figures are symmetrically arranged on both sides in a same picture, which include: a hawk chasing a dove; the dove turning to the king for help; the queen persuading the king from doing so; cutting flesh from King Sibi; King Sibi sitting on the weight; the praise of celestial beings and people; and weighing the dove. King Sibi sits in a easy going posture. Above him is the scene of the hawk chasing the dove; and on the right side are attendants in panic, and on the left are people praising King Sibi's conduct. In the lower left corner there is a man in non-Chinese styled costume holding a weight.The wall in the back is also divided into three registers: the upper register has eighteen heavenly musicians, and the middle register has four arch niches containing either a preaching Buddha or a dhyana Buddha. The interior walls of the four niches respectively have four, six, four and six children playing on lotuses. The niches are connected to each other by the niche beams decorated with honeysuckle motifs. The west side of the Sattva jataka is filled with the thousand Buddha motifs, in the center of which is a preaching scene of the white-robed Buddha. Below the niches is a decorative border and below the border are twenty-five yakshas. The arch niche contains a cross-legged Maitreya Buddha with a waving updo and an outer red kasaya tightly clinging to the body. In the niche on the south wall is the trace of one bodhisattva and on the north wall are traces of two bodhisattvas. There were originally two bodhisattva statues outside, now only the one on the north side is preserved. The nimbus decorated with apsaras and flames is flanked by two apsaras and six bodhisattvas on each side. Below on the south are Vasistha and on the north Mrgasirsa. There is a lion painted on each of the throne. The lintel molded in bas relief is decorated with honeysuckle motifs and children playing on lotuses. The molded beam has a dragon head supported by pillars wrapped in silk. Above the lintel are two apsaras and on two sides are sixteen molded figurines altogether. Below the niche on the base are images of ten yakshas. The upper niche has a cross-legged bodhisattva statue and there are twenty-five molded figurines on the two sides out of the niche and above the niche. The lower niche contains a dhyana Buddha (the head is damaged). Out of the niche on the two sides are statues of attendant bodhisattvas, and the one on the west side (partly damaged) is preserved. The nimbus on the inner niche wall is flanked by two bodhisattvas and six children playing on lotuses (all blackened due to the sootiness). The molded lintel is decorated with lotuses and honeysuckle motifs (blackened due to the sootiness), and below the niche are images of eight yakshas. The upper niche contains a dhyana Buddha. On the west side out of the niche are twenty-two molded figurines. The lower niche also contains a dhyana Buddha. On each of the two sides out of the niche is a bodhisattva statue (the head is missing). The nimbus on the inner niche wall is flanked by two bodhisattvas and six children playing on lotuses (all blackened due to the sootiness). The molded lintel is decorated with lotuses and honeysuckle motifs, supported by pillars wrapped in silk. And there are three figurines survived on the two sides. Below the niche are images of six yakshas. In the upper niche is a cross-ankled bodhisattva flanked by two attendant bodhisattvas (whose heads are missing). There are nineteen molded figurines survived on the two sides out of the niche. In the lower niche is a dhyana Buddha flanked by two attendant bodhisattvas out of the niche. The nimbus on the inner niche wall is flanked by two bodhisattvas and six children playing on lotuses (all blackened due to the sootiness). The molded lintel is decorated with lotuses and honeysuckle motifs. The molded beam has a phoenix head on both ends supported by a pillar wrapped in silk. Below the niche are images of six yakshas. On the flat ceiling in the back are painted laternendecke motifs in succession, which has a lotus in the center and asparas, honeysuckle or flames in the four corners.On the space between the laternendeke motifs on the south and north sides of the central pillar is a pair of apsaras. There are sixteen molded rafters on the two slopes of the front gabled ceiling, on he both ends of the beam and under the rafters are painted wooden brackets. Between the rafters are images of celestial beings holding lotuses. North wall Part of a preaching scene is preserved.